It’s hard to believe that it’s August and school supply lists are already posted at Wal Mart. When I was a kid, school didn't start till after Labor Day. The summer really was three months long. But no matter when it started, I was always excited to return to school. 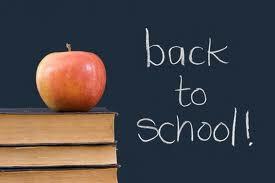 For kids and teenagers alike, the beginning of school is a mixture of excitement and fear. Excitement to be back with friends but the fear of change, a new teacher, a new classroom and, worst of all, a new locker (with a combination). I remember when we put Eric and Elizabeth on the school bus for the first time. Jeanie and I both cried as the bus drove away. We needed to let them go, but suddenly they were on their own for most of the day in elementary school. Sure, they had some tough days, but learning to be on their own was so good for them. Junior high presented it’s own challenges, different for both of our kids. Organized school sports began with all its pressure. Both of our kids learned so much about peer pressure, both positive and negative. Since girls mature and develop earlier than guys, they begin the maturity process earlier than the guys and their emotional needs and self-esteem are developing at a faster pace. Most of the guys are still clueless about the girls and would prefer a Cardinal game. High school might have been the biggest challenge. The guys catch up to the girls and everyone learns appropriate interaction with each other. Teens are walking through that awkward balance of independence and dependence. They are learning to be on their own, but still need mom and dad. College is the literal moving on and learning to handle life without mom and dad, while figuring out what career field to pursue. Graduate school, home school, night school, and Sunday school…. The list goes on and on. It seems we’re always in school in some way. The best thing we can teach our kids and teens is to go into school with a firm faith and an open, teachable heart. There is so much to learn. There are all the basic disciplines of math, history and science. But school is more about learning how to work, learn and get along with people. Sure, it’s difficult to let our kids go, but all the lessons learned in the home need to be tempered in the heat of school relationships. When I went to Baylor, my freshman year was eye opening to so many things. Baylor is a private Baptist school and many of my friends were experiencing freedom for the first time. Some handled it well, but one friend did not. Though he was a high achieving student in high school, he was very sheltered during his grade school years. He was dismissed from Baylor after the spring semester for poor grades. “Unbelievable,” I thought. But he took the freedom and ran with it, drinking, smoking, and not studying along the way. As this new school year begins, pray for the right balance between structuring your child’s life while allowing them the freedom to fail and succeed. Whatever school your child is attending, be thankful for his successes, but also thankful for his trials. Remember, trials aren't just good for parents - our kids need them too!